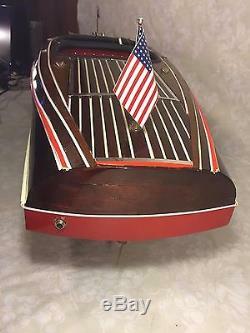 Dumas Chris-Craft Runabout Remote Control Boat w/ Astro-21 Motor 1938 Model #1241 w/ Stands 43.5 Long. Would make a great gift or keep it for yourself! 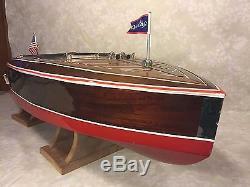 This Dumas Chris-Craft Model Boat came from the extensive collection from a NJ estate. We have a number of that collector's marine/nautical items that will be listed soon for sale separately in our store wood and resin figureheads, double glass electric lanterns, brass spotlights, Dumas Chris Craft remote control model w/ engine (similar to a 1241), a newer Celstron telescope, custom compass rose table and wall plaque and other lanterns. The listing numbers will be noted below once they are published. 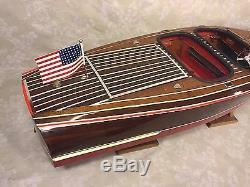 What a great looking boat model here. The boat hull here is made of wood, not some composite material. Very large model as well as 43.5 long from bow to stern. This appears to have been a Dumas Products model. Looks similar to a model 1241, which was a 1938 27 footer. However, this does not have the third seat in the rear, so this is probably a similar model that was discontinued and they are no longer making. 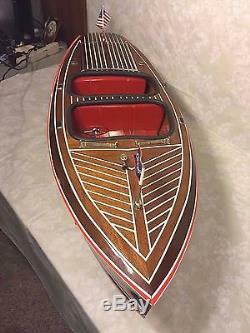 This wood model kit boat was put together quite meticulously. 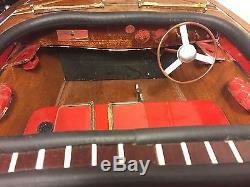 The seats, armrest, steering wheel and throttle are all in place. Nice paint and decals on the boat body. The red paint on the bottom shows a little wear, most likely from the two wood stands it sits on. The brass propeller and rudder are securely in place as well. The front windshields are with the Chris- Craft, just need to be glued back in place. The red colored seats seem to be made of plastic. Do not see any repaired damage to the hull from the outside. This model even has an electric Astro-21 motor in it. Looks like the mechanism takes two AA batteries to operate. 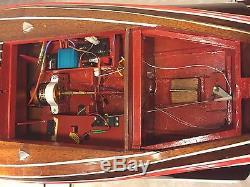 Cannot say if the motor runs as there was no master control unit with the model boat to test it. The nickel plated metal horns and other hardware are still in place. Also has a Chris-Craft flag on the front and an American flag on the back of it. 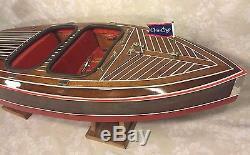 This Chris-Craft boat model by itself is 9" tall (11" on the stands), by 43.5" long, by 14.75" wide. The flags sit another 4 above the deck of the boat. Would make a great conversation/decor piece or use it again! Let us know if you have any questions or need additional pictures. Dont be shy to make an offer, we are always open to reasonable suggestions. The pictures provided both complement and supplement the listing description, so please look at them very closely as well. With old items, there is no way one can capture all the little imperfections in words, so the two media are meant to be the full description. We will also deliver the item within 250 miles one way of Wilmington, DE. Make sure that this item meets your needs and requirements before deciding to acquire it. So, please carefully review all the attached pictures. Ask all the questions you have, come see in person or send a friend to see the item on your behalf, prior to deciding to acquire it. Please check out our other Timeless Tokens store listings as we are regularly adding new items. We specialize in vintage artwork, books, collectibles, furniture, musical instruments, paper ephemera, marine/nautical, and clocks/watches. Select countries (disclosed in individual item description). All items are as described, with any item history, known defects or imperfections disclosed in each listing. Welcome to Timeless Tokens, our online store, offering antiques, collectibles, and conventional merchandise for every need and occasion. Timeless Token represents the fulfillment of a long-held dream to create a business that allows us pursue our passion for finding unique collectibles and everyday items that can be shared with and appreciated by all. Our listings are updated regularly and focus on items that we know best - vintage artwork, books, clocks, collectibles, furniture, toys/model trains, musical instruments, and decorative boxes. We appreciate your taking the time to visit our store, and hope you will provide us feedback that will enable us to make your shopping experience the best it can be. Referrals are an important part of our business. 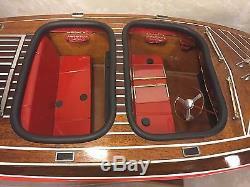 The item "Dumas Chris-Craft Runabout Remote Control Boat Astro-21 Motor 1938 Model #1241" is in sale since Sunday, July 17, 2016. 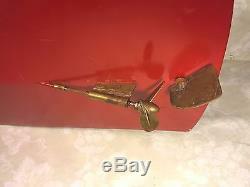 This item is in the category "Antiques\Maritime\Other Maritime Antiques". The seller is "hallboys321" and is located in Wilmington, Delaware. This item can't be shipped, the buyer must pick up the item.